The Estes Park Brewery is located in Estes Park, CO minutes from Rocky Mountain National Park, The Stanley Hotel, and many other tourist attractions. I had to opportunity to visit Estes Park Brewery after a day of hiking in Rocky Mountain National Park, and was impressed with the selection, and quality of the beer. The location of the brewery makes it a perfect destination for anyone that enjoys a beer after hiking, biking, or simply taking in the scenery in the area. In 1993 Gordon Knight started High Country Brewery in Boulder, Co. That same year Ed Grueff opened the Event Center in Estes Park. In 1994 Ed and Gordon decided to combine the two businesses and the Estes Park Brewery was born. 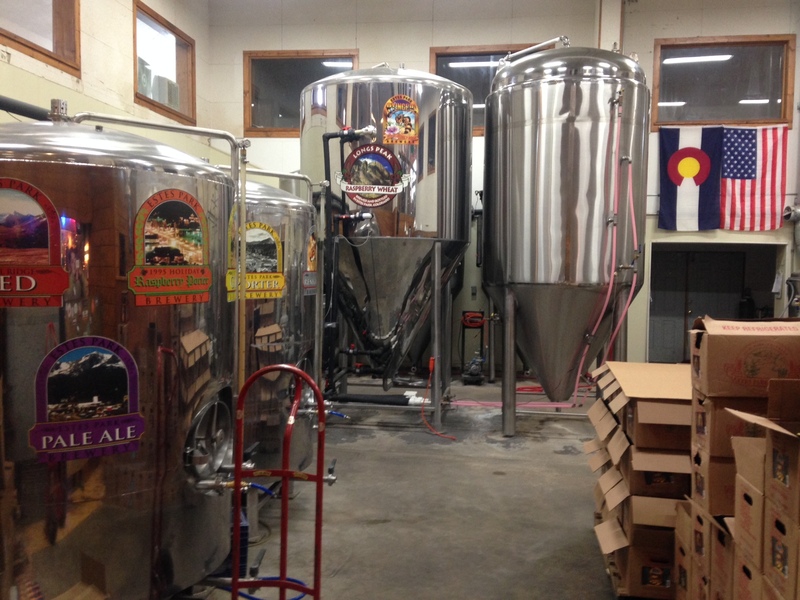 The original Brewing equipment which consisted of a 4 1/4 Barrel Brewhouse was moved to Estes. For the first summer the Event Center kept the main floor as a stage and dance floor. For the first summer the Estes Park Brewery offered four beers: Estes Park Porter, Estes Park Renegade, Longs Peak Raspberry Wheat and Estes Park Pale Ale. In the fall of 1994, Gordon Knight decided to sell his half of the business. When Gordon left, Eric Bratrud took over as the head Brewer. The Brewery also expanded to a 14 BBL Brewhouse and moved out onto the main floor where is now located. In 1995 the Estes Park brewery started packaging their beers in 12 oz bottles, which expanded their market. By this time they added a number of beers including Trail Ridge Red, Estes Park Gold, Stinger Wild Honey Wheat and Samson Stout. 1995 was also the first year of the Best of the West Brewfest held in the Brewery parking lot. Since ’95 we’ve continued to evolve both in our restaurant and with our brewing operations. In 2003 Tyler Lemirande and Eric Bratrud took over as owners. I had the pleasure of sitting down with Tyler and talking craft beer during my visit to the brewery. Tyler is a very nice guy that enjoys providing fresh craft beer to tourists, and locals alike. The atmosphere at Estes Park Brewery is unique compared to many of the breweries I’ve been to in the Denver area. Unlike many of the breweries around Denver, Estes Park Brewery has a restaurant with a pub-style food menu, a full bar, arcade games, and tons of seating. Due to its unique setup, Estes Park Brewery is a great place for the whole family to visit and enjoy a meal, or a fun gathering place for those only interested in getting a locally brewed beer. The beer at Estes Park Brewery is comprised of quite a few different styles. There’s definitely a beer for all different types of beer drinkers available at the brewery. One of the really great things about the brewery is that visitors can try samples of different beers on the main floor before they head upstairs and order a beer. I’ve never been to another brewery that advertised free samples to visitors. Estes Park Brewery’s approach to samples allows visitors to try new styles of beer without buying a beer they don’t like. While I was trying a few samples, I overheard a lady say “she never tried anything like that, and it was really good!” As someone that’s grown to love beer in all different styles, I think it’s awesome to have a brewery promote trying different beers until you find one you like (up to 4 samples are free). The list pictured below is the list of regular beers you will typically find at Estes Park Brewery. My favorite beer at the brewery was actually a seasonal, and one that can be found at The Stanley Hotel, the The Shining Pale Ale (in honor of Stephen King’s The Shining). From EPBrewery.com, “The Shining Pale Ale is brewed with rare British All-Star pale malt to give the beer a full body and unique flavor. We hop with Amarillo and Cascade hops. Of course this beer is named after the book “The Shining” by Stephen King. We don’t guarantee clairvoyance after after a pint or two we just hope you enjoy the experience.” I really enjoyed the pale ale, and look forward to the next chance I get to drink it. 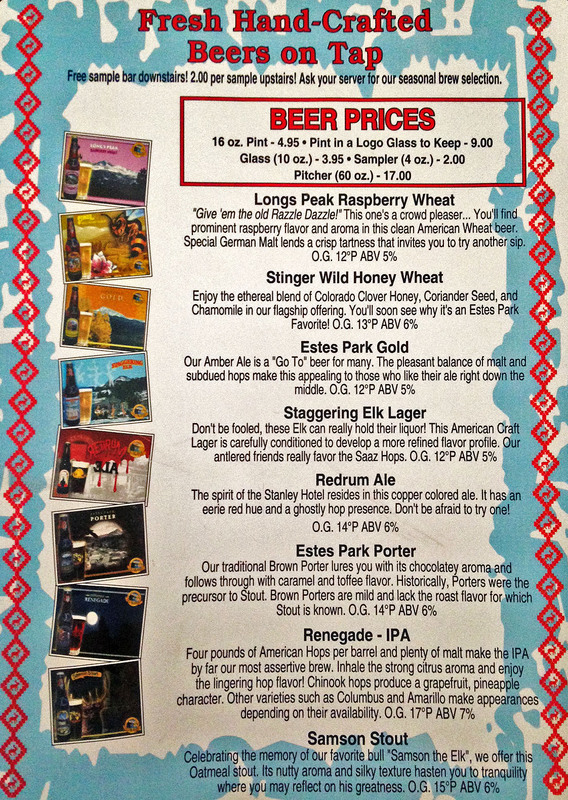 The two top sellers at Estes Park Brewery are the Stinger Honey Wheat, and Bear Lake Raspberry Wheat. Both of these are great beers for those that enjoy lighter beers without much hoppiness. Of the two, I really liked the Stinger Honey Wheat, which is brewed with local Colorado honey. The honey taste is subtle and the beer is a really smooth, drinkable beer that is not overly sweet. I want to thank Tyler Lemirande for taking the time to sit down with me and talk craft beer. I had a great time visiting Estes Park Brewery, and look forward to my next visit. I highly recommend visiting the brewery to anyone that’s able to make it to Estes Park. There’s a lot to see and do around Estes Park, and stopping in at the brewery should be on your list!